Are you trying to find a capable SUV that can get you through all of the adventures that you have planned? Come to Victory Ford to learn about the Escape and all that it offers. 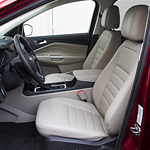 This popular compact SUV could be just the vehicle that you are seeking. When the road conditions get bad and you are trying to stay in control of your vehicle, it can be helpful to have a four-wheel drive system that you can rely on. Ford gives you the option to get set up with an Intelligent Four-Wheel Drive system when you purchase the Escape. If you have a trailer full of cargo that you would like to haul across Kansas City, you need a vehicle with good towing power. The Ford Escape is set up to help you tow all of the loads that you need to tow and to do that without a struggle.